Vincent Fumo's chronicle of corruption is extraordinary, even by the "standards" of Philadelphia, PA. Thus, it's a journalistic fail that in a story about the convictions of former 30-year state senator Fumo and longtime associate Ruth Arnao, NBC Philadephia (HT Michelle Malkin) did not identify his or her Democratic Party party affiliation. Guilty is the verdict on all 137 counts for Vince Fumo in his federal corruption trail. His co-defendant Ruth Arnao is also guilty on all counts against her. It was standing room only as the verdicts were read, capping off a dramatic five-month trial and a dramatic morning. Attorneys for both sides argued over whether Fumo was a flight risk. The government asked for Fumo's bail to be revoked saying he had a "strong incentive to flee." The judge decided not to revoke Fumo's bail and instead set a hearing for 2 p.m.
Fumo hugged his younger daughter, who was crying. He hugged his girlfriend, Carolyn Zinni, who was also in tears. The man who once held arguably the most powerful political position in the state, now faces time in federal prison. ..... Fumo is guilty of defrauding the Senate, a charity and a museum of $3.5 million and with destroying evidence. He left the Senate last year after 30 years. The trial, which started Oct. 22, featured more than 100 witnesses and 1,300 exhibits, made OPM a household acronym and gave us much more than a glimpse of Fumo's failed relationships as a friend and a father. Taxpayers found out how their hard-earned money was being spent, at times, on dinners Fumo had with a former girlfriend. Her testimony revealed a power-hungry man with a sense of entitlement who often picked up the tab with "OPM," his acronym for "Other People's Money." Fumo's and Arnao's party affiliations are also nowhere to be found in a Philadelphia Inquirer story ("Longtime Fumo associate Ruth Arnao guilty on all counts"). UPI.com mentioned Fumo's Dem affiliation in its second paragraph. An initial four-paragraph report from the Associated Press mentions that Fumo is a Democrat in its final paragraph. A later report carried at a Nashville, Tennessee station's web site saves it for the final paragraph of five. Another AP item whose timing is undetermined has it in the third of five paragraphs. A fourth AP story carried at KDKA has a third paragraph with an odd post-conviction use of the present tense -- "The 65-year-old Philadelphia Democrat is charged with defrauding the senate, a nonprofit and a museum of more than $3.5 million, and destroying e-mail evidence." 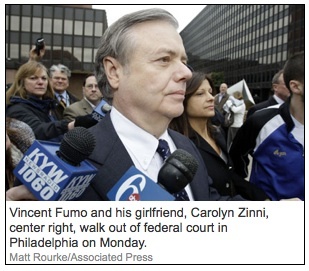 Philly's Fox TV station ("Jurors Blast Fumo After Verdict") has it in Paragraph 2. PennLive.com's story ("Fumo guilty charge brings ethics to the forefront") doesn't directly identify Fumo as a Democrat. Its 6th paragraph refers to a different Keystone State Democratc scandal, noting that "As news of the Fumo verdict broke, there were new developments in Bonusgate, too. In that scandal, Democratic house staffers are charged with spending working hours doing political work for the Democrats." The Pittsburgh Tribune-Review waits until the seventh paragraph to describe Fumo as "once a powerful Democrat." Later in the story, the paper did a good "no comment" roundup ("Many lawmakers, particularly Senate Democrats, didn't want to talk about the verdict"), naming the names and flagging the party of Governor Ed Rendell and Senate Appropriations Chair Jay Costa. The Pittsburgh Post-Gazette did the best job with the story of all those I reviewed. Its headline ("Fumo, powerhouse of Pa. Dems, guilty") is the only one I saw with Fumo's affiliation, and it appears to have been the only publication to note that "Twice before, the former state senator and Democratic power had beaten criminal charges." Though it goes a bit over the top at one point ("there was no escaping yesterday as jury forewoman Karen White delivered guilty verdict after guilty verdict, her words falling for 13 long minutes like dirt into a grave"), it importantly describes key elements of Fumo's claims and testimony, portraying an incredibly arrogant man who thought himself untouchable and made OPM (Other People's Money) a lifestyle -- something that in this case, considering how long his fellow party members tolerated his behavior, is properly associated with the Democrats.